The first phase of the regeneration of Cardiff's Brains Brewery site has been approved by council planners. 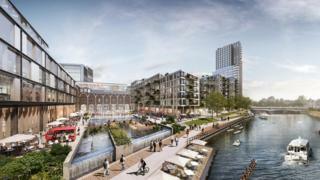 The Central Quay development will include 50 new bars and restaurants and 1,000 apartments. Plans for a seven-storey, 695-space car park and a new public square have also been approved by the local authority. Around 1.5 million square feet of offices and a university campus will also be built as part of the development. The first phase which has been backed includes an 11-storey building - to be known as The Ledger - which will feature a market, cafe, office space and gym. The majority of the seven-storey car park will be for public use, as 284 parking spaces in the area, including the railway station, will be lost as part of the development. Brains Brewery plans to relocate to Cardiff's Pacific Business Park next spring. The development will link up with Central Square, which includes the BBC's new headquarters, and the city's new bus station. Developer Rightacres has said work could start in September with the office building due to be completed by June 2020.